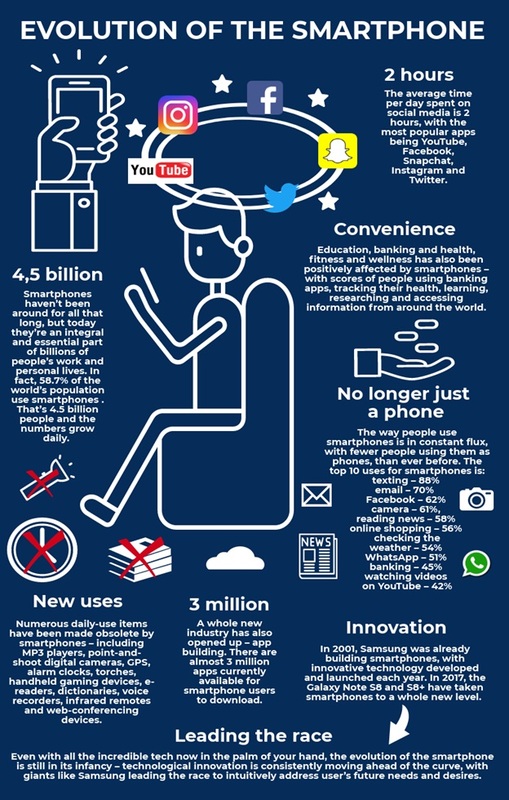 Can you even imagine your life without your smartphone? It hasn’t taken long for these must-have devices to become an essential and integral part of daily life. It’s estimated that as much as 58.7% of the world use smartphones. [i] But how have they changed the way we do things? Doing business on a mobile device has gone beyond sitting in a coffee shop making endless phone calls. E-mails, internet research, design and invoicing are all now possible. Capturing images and videos on the go has never been easier and in-built security features like Knox make it entirely safe to conduct business wherever you are. When it comes to education, learners not only have access to the internet but also to the world’s best teachers and experts, through their devices. According to a survey, almost half of Smartphone users use their phone for access health-related services. [ii] Whether it’s to use an app to monitor glucose levels or verify a prescription, a fitness tracker or healthy recipe finder, smartphones have impacted the way people interact with their own health and wellness. In 2012, editor of the website The Next Web, cataloged devices that were made obsolete by smartphone. His list included MP3 players, point-and-shoot digital cameras, GPS, alarm clocks, flashlights, handheld gaming systems, e-readers, voice recorders, dictionaries, infrared remotes and web-conferencing devices. This is a lot longer now.